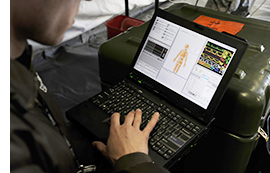 Military computers are a specialty at Computer Dynamics. Whether you choose an off-the-shelf industrial computer tested to MIL-STD-810 standards or upgrade it to a ruggedized system customized to your specifications, you'll get a military PC that can withstand desert sand and heat as well as cold, moist weather common to mountainous regions. Our military computers are designed for commercial and industrial use right out of the box with low power consumption, a fanless cooling system, and a genuine Intel ATOM Dual CoreTM processor. Made to last, our military PCs are built tough with corrosion protection applied to the aluminum alloy housing, a fully IP65-compliant enclosure, with shock and vibration resistance built in. Also, our military computers will operate in temperatures ranging between -4° F and 131° F.
Enhance your system with a sunlight readable display and a resistive or infrared touchscreen, eliminating the need for a mouse or keyboard. Extend the shock and vibration rating by choosing to install SSD. Select a color LCD display in sizes 8.4 inches, 10.4 inches or 15 inches. Whatever your needs are, our durable military PCs will exceed your performance expectations. Contact us with your specifications today and learn more about our rugged, industrial computers.